Technical Exhibition | Mentel Co.,Ltd. The ATOS ScanBox is a complete optical 3D measuring machine which was developed by GOM for eﬃcient quality control in the production and manufacturing process. The ATOS ScanBox has been installed several hundred times worldwide and is successfully used in a variety of industries. The industrial optical 3D digitizer captures up to two times 16 million measuring points per scan and is used as a high- end scanning and inspection system in quality control. for full-ﬁeld acquisition and digitizing of contoured part geometries. The fringe projection system is used for pro- duction quality assurance of small to medium-sized parts and excels by its high precision for ﬁne details. The compact class excels by its ﬂexible use. Along with the precise 3D scanner, laptop and stand ﬁt into one case, such that tools and parts can be measured directly on-site. The optical 3D scanner provides 3D coordinate measur- ing data for inspection and adaptive manufacturing. ATOS Core serves as mobile measuring device and station- ary desktop scanner. In addition, it supports automation processes within the ATOS ScanBox. The portable photogrammetry system measures coor- dinates of three-dimensional large objects, e. g. wind power plants or ships. The high-resolution images can be evaluated immediately on the laptop. Mobile CMM for shop ﬂoors. Combined with the GOM Touch Probe, the optical measuring system is used for online part alignment, enabling an assembly analysis that is based on augmented reality and image mapping. GOM’s 3D motion and deformation sensor for materials testing, part deformation analysis as well as crash and 6DoF evaluation. ARAMIS captures 3D coordinates, 3D displacements, velocities and accelerations of loaded specimens and components. for materials and components testing, GOM oﬀers comprehensive education packages for theory and practice lessons at schools, higher education institutes and universities. Measuring systems from GOM are used in stamping, bending, drawing, pressing, and forming process chainsto guarantee consistent quality assurance: from determin- ing the sheet metal properties, via accelerating tool try- out and ﬁrst article inspection, up to series accompanying production control and assembly analysis. For design and simulation, GOM systems provide precise material proper- ties by determining the forming limit curve (FLC). 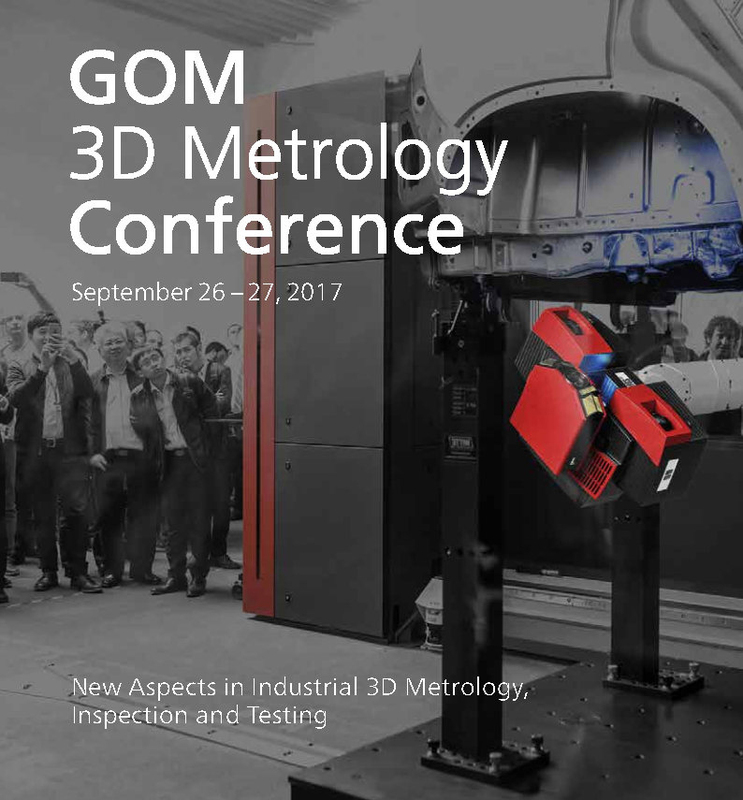 With its ATOS ScanBox, GOM presents automated mea- surement and software solutions for the inspection of large and heavy sheet metal parts. The measuring cells were particularly designed for full-ﬁeld measurement of side panels, car interiors or complete body-in-whites in press and body shops. GOM systems support the aerospace industry and its suppliers by providing precise part geometries and material characteristics. Furthermore, optical 3D scan- ners are suited for quality control of complex freeform surfaces. Therefore, they are used to inspect airfoils of aircraft engines, terrestrial gas & steam turbines and turbocharging systems. GOM systems allow for inspection planning based on construction data. In pattern and mold making, targeted tool correction and inspection of ﬁtting for mold halves, core allowance and sliders are possible. During try-out, cast parts are checked for shape and dimension: com- ponent geometry, material thickness, shrinkage and warpage. For series-accompanying quality control, all measurement and inspection processes are automated. In plastics engineering, 3D metrology supports and speeds up all phases in injection molding, blow mold- ing and thermoforming processes: from prototype & tool construction to ﬁrst article inspection reports up to assembly analysis and load testing. Materials research and component testing play an im- portant role in product development. ARAMIS provides information about the properties of the materials used and the behavior of the products under load. These results form the basis for product durability, geometrical layout and reliable numerical simulation and validation.